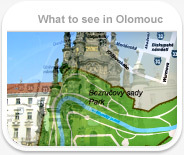 Flora Olomouc Exhibition Grounds currently organizes dozens of exhibitions throughout the year and manages 47 hectares of Olomouc parks including Smetana, Čech, and Bezruč Gardens, which are open to the public. Visitors are most often attracted by beds of blossoming tulips of the latest varieties and hybrids, especially during the springtime FLORA OLOMOUC exhibition. The botanical garden areas, with the alpine garden, Rosarium (rose garden), aromatic and medicinal plant garden, and perennial and spring forest-plant gardens are located at the Crown Fort. The most interesting feature is the palm conservatory, which, together with the Smetana and Bezruč Gardens, is a cultural monument of the Czech Republic. The goal of Flora Olomouc Exhibition Grounds is to satisfy a broad range of public interests with its unique facilities, as well as to fulfill the human desire for tranquility, beauty, and harmony with the natural charm of the parks and gardens.